We were both too tired to cook tonight so we opted for battered sausage and chips from the local chip shop. Simple pleasures – holding the warm brown paper bag close to me to keep me warm as I walked home, unwrapping the paper parcels, sprinkling salt and vinegar and, of course, the eating. The ultimate – hot, salty chips eaten straight from the paper, outside on a cold, cold winter’s evening. I’ve never been remotely tempted by the lure of cheesy-chips. What’s that all about? I guess it’s better than my sister’s fave, chips-n-gravy from the Chippy. Your question has reminded me of a dish I experienced whilst living in Montreal. Originating in Quebec, Poutine is a popular fast food dish in Canada. It consists of chips covered with curd cheese and then a special kind of gravy. The cheese becomes soft and warm but doesn’t completely melt. Up in the far north of Scotland there is a tradition of chips, cheddar cheese AND gravy. No it’s not as disgusting as it sounds but then we are talking about the same people who eat haggis!!! 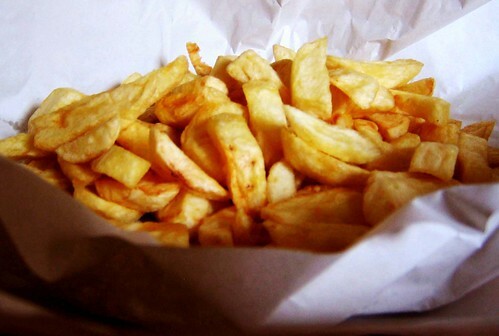 I love old fashioned chip shop chips too, eaten on the way home when it’s really cold. Sadly, they seem to be quite hard to find in Central London now. Most places seem to make french fries instead. One day soon I’m going to try to make my own chip shop style chips! Oooh melted cheese over hot chips, it’s fabulous! I have to say though, I think I’ve only ever eaten them when drinking in a bar and I have the munchies. I think I’m with you on the gravy and chips thing though.